The Gerbera Sunshine Bouquet consists of a colourful medley of mixed gerberas surrounded by green aspidistra leaves, creating quite the visual spectacle! Perfect as a colourful gift or as a decorative feature in your own home, this bountiful bouquet will attract attention and admiration wherever it goes. 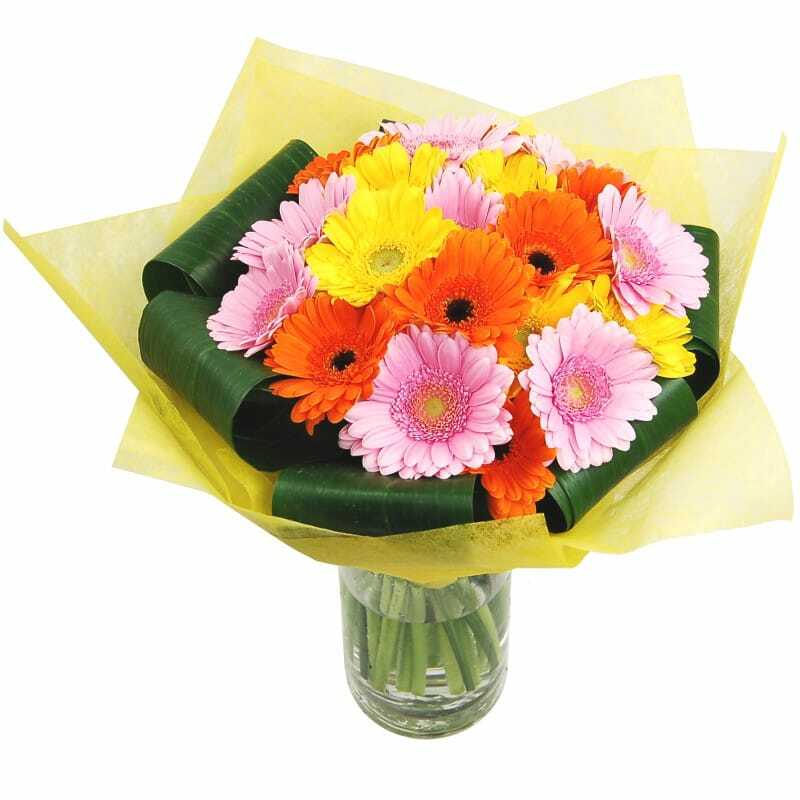 Show that special person how important they are with the Gerbera Sunshine Bouquet - a flawless selection of beautiful gerbera for only £24.99 including free next working day delivery. Have these flowers delivered 7 days a week throughout the UK. Your flowers will be delivered in our special delivery box to prevent damage while in transit, so they arrive in excellent condition. This vibrant and versatile bouquet is great for birthdays and anniversaries or as a present to say thanks. For that extra special personal touch, why not a box of delicious Lily O'Briens Chocolates, a cuddly teddy, a chic glass vase or a Handwritten Card to say thank you. We also have a large selection of flowers under £35 as well as many arrangements containing gerbera, germini and an array of different gift sets to suit every occasion.